Table with a stained sycamore top and steel frames painted bright red. The table top is sycamore stained black with a water-based dye. The steel frames have finger-jointed frames. The supports are made from square tubular steel finished with coloured epoxy coating. 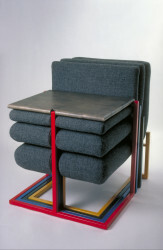 Set Of Truckle Seats With Table, Floris van den Brocke, 1980, Crafts Council Collecton: W38. Photo: Heini Schneebeli. This piece represents an attempt to condense the possibility of adopting various postures as my other furniture, into small space. It also introduces metal and is seen as a sample for small batch production.